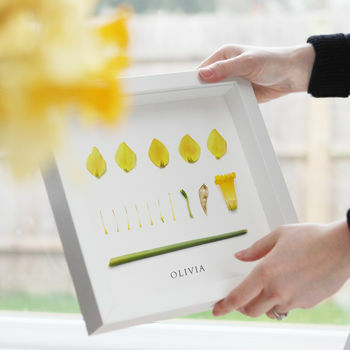 Beautiful photographic artprint featuring the birth month flower for March - the daffodil. The perfect gift for any flower lover. The Daffodil photographic print features the petals of a deconstructed daffodil flower, which is thought to celebrate creativity, inspiration and new beginnings. It is also the flower that symbolises the 10th wedding anniversary. Comes unframed, or you can select a basic white frame from the drop down menu. Please note that this product is a photographic print and does not contain real flowers in your order. Delicately photographed in our Kent studio and digitally printed in the UK on luxury 100% cotton 255gsm archival paper. Comes ready to frame in a flat packed envelope or poster tube. This product is dispatched to you by Sarah Blythe.